When the covering was removed from the image of Pier Giorgio Frassati draped on the facade of St. Peter's Basilica in Rome as he was newly proclaimed Blessed by Pope John Paul II on May 20, 1990, what became visible to those present was not the classic portrait of a saint. Surprisingly, it was the photo of a strong, young man wearing the gear of a mountain climber, leaning on a long ice-axe, with one foot resting sturdily on a rock. 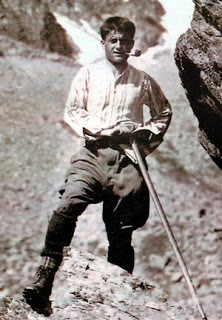 A month before his death at the age of 24, Pier Giorgio Frassati and some of his friends had been climbing in the Val di Lanzo, where some difficult points had to be overcome by climbing or by using a double rope. On the photo which shows him holding onto the rock gazing up toward his goal, he later wrote the words, "Verso l'alto"; in English, "toward the top." It is a short phrase which was the synthesis of his way of life: always seeking what enhances, that which carries us beyond ourselves, toward the best we can be as people, toward the best of ourselves. 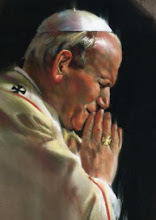 It is to strive toward perfection of life; in other words, toward sainthood. It means to strive toward the source of life: God. The mountains were Pier Giorgio's favorite place: "With every passing day, " he wrote to a friend, " I fall madly in love with the mountains; their fascination attracts me." From his youth, he was accustomed to climbing the highest peaks. He was a member of the Italian Alpine Club and climbed the Gran Tournalin (3379m), the Grivola in the Val d'Aosta (3969m), Mon Viso (3841m), the Ciamarella (3676m), the Bessanese (3532m) and a large number of lower mountain peaks. He also lived through some critical situations, such as a sleepless night spent in a hole dug in the snow and a descent in a snow storm. For him, the mountains represented the pleasure of testing his athletic body, filling his lungs before the strain of a skiing competition or a difficult climb. He experienced the spirit of emulation always tinged with contagious joy. The mountains for him also meant the joy shared with his companions: either his dearest friends or perhaps more improvised companions for whom he expressed all his kindheartedness and generosity. He took upon himself the burden of those who were a bit slower or tired. At times, he would say his foot hurt and he needed to stop and rest, so as not to humiliate those who really needed to do so. Or he would go back and forth between the mountains and the plain in order to lighten the backpacks of those who were a little weaker. He did all this with a good spirit that nothing could destroy, not even fatigue. With a rather offkey voice he would start singing a song for the group or, in the silence of the camp, he would invite everyone to pray before going to sleep.Everyone can draw some inspiration from the way in which Pier Giorgio Frassati lived. The mountains, his mountains, can be a school, a temple, a gymnasium to help each of us strive ever always toward the top.